This just might be my new favorite chicken recipe! Crispy and flavorful…and it’s baked not fried so it’s healthier! 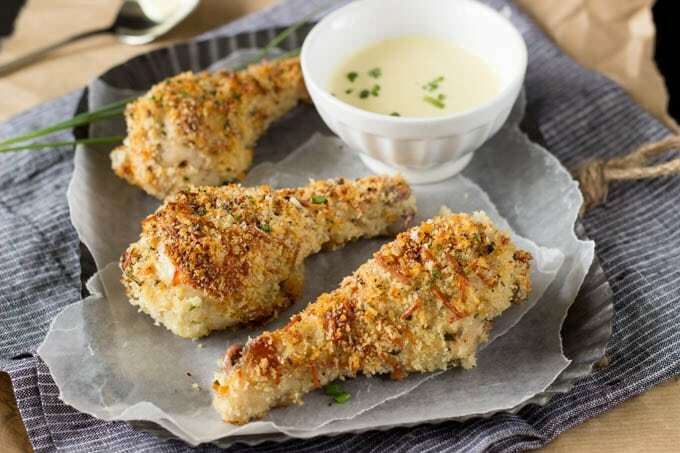 The honey mustard dipping sauce is bursting with flavor! I might have had a spoonful (or two, or ten) straight up…nom nom! Family friendly and easy to make. All you’ll need is a baking pan (preferable with a wire rack), a shallow pan (for mixing the panko and spices) and a big zip-lock bag (or bowl) for marinating the chicken. It’s really that easy. You’ll put the chicken in a big zip-lock bag and let it marinate in the low-fat buttermilk for at least an hour. The buttermilk helps to tenderize the chicken, making it more moist and flavorful. It also helps the chicken bake up crispier (while still staying juicy and flavorful inside). It’s like magic. If you’ve tried cooking chicken after it’s been marinated in buttermilk then you know exactly what I’m talking about, if you haven’t…then I’m encouraging (or more like begging ) you to give it a try. It’s crazy good! 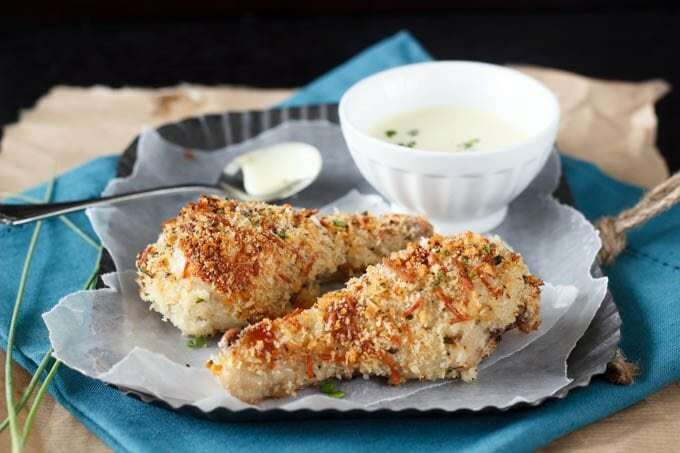 The panko crust gets a flavor infusion from the addition of fresh garlic, onion, parmesan cheese, salt and pepper. The chicken gets baked (not fried) but I promise it tastes every bit as good as the fried variety. Kids who love “chicken nuggets” will love this! ( but shh…you don’t need to tell them that it’s actually much better for them). Oh, and did I mention, the homemade honey mustard dipping sauce is TO DIE FOR! Besides being super easy and tasty ,this meal is also a budget friendly. Chicken thighs can usually be bought in large packs from the grocery stores inexpensively. Here’s a way to have a delicious, inexpensive, home cooked meal any night of the week. A couple of tips: 1) the chicken can be marinated for up to 24 hours, so toss it in the zip lock before you head to work, and when you get home you can bake it up and have it on the table in about ½ hr. 2) this chicken and dipping sauce tastes every bit as good cold, so make a few extra and have them for lunch or dinner the following day. Pierce each chicken drumstick with a pairing knife, 2-3 slits in the meatiest part of the chicken. In a large zip-lock bag, combine chicken, buttermilk, onion, and garlic. Shake in the bag to coat the chicken, and refrigerate for 1 hour. Combine Panko, Parmesan cheese, and chives in a shallow bowl. Remove chicken from zip-lock bag and discard marinade. Sprinkle chicken with salt and pepper. Dredge each piece of chicken in the Panko mixture, pressing to adhere panko to the chicken. Lightly spray each Panko coated chicken drumstick with cooking spray and arrange on wire rack (or aluminum foil). Bake for 30 min. or until chicken is done. (if you are not using a wire rack you will need to turn the chicken half way through the cooking process). While chicken is cooking, prepare the dipping sauce. Combine mayonnaise, yogurt, honey and two types of mustard in a small bowl. Serve sauce with chicken. Chicken can be served warm or cold. 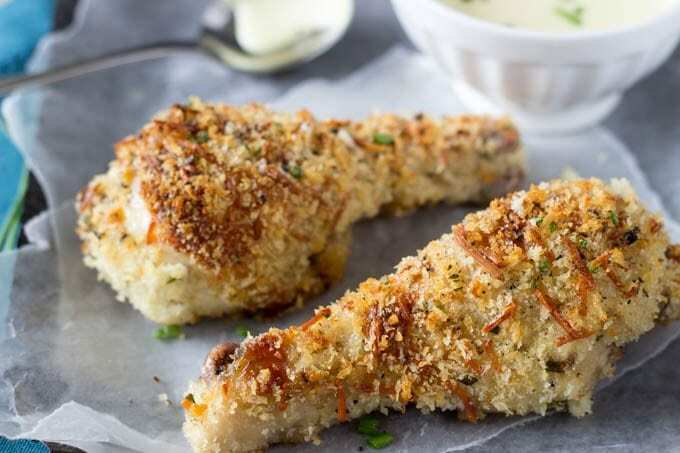 It’s hard to believe that these chicken drumsticks are baked considering how crispy, crunchy and golden they look! Definitely inspired to make the recipe.. I am a massive sucker for chicken slathered in honey mustard! 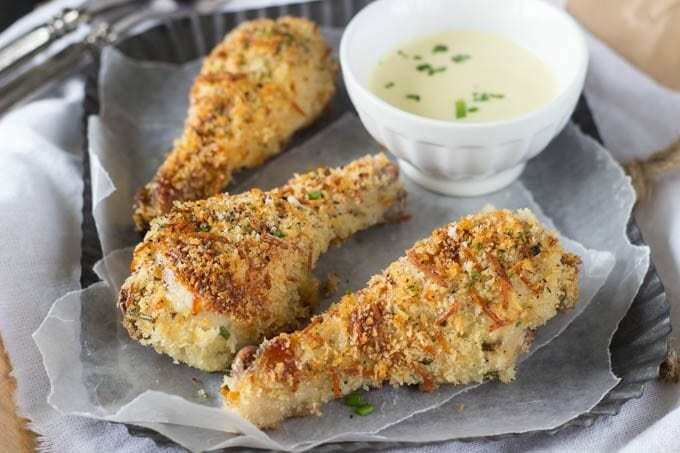 I can just imagine biting into these crispy crunchy yet tender chicken drumsticks. These look AND sound absolutely delicious! !